The Flexible Learning Advisory Group (FLAG) was the inspiration of its first Chair Dr. Cecil Linehan, whose enthusiasm and drive continues to motivate the program even as she steps down in favour of Professor Phillip Dowell. The 2010 Maastricht meeting challenged us regarding continuing education (CE) and humanitarian aid. 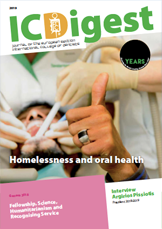 The FLAG group advised on the ICD’s future in this regard with many Fellows offering further help for the CE drive and its relationship with UDente (Universal Dental e-learning), as well as their humanitarian aid services. Although humanitarian and CE projects can be separated, it is equally conceivable to consider CE as part of humanitarian aid in as much as it improves both knowledge and standards of care in middle and low income countries. Udente can be delivered via the internet in areas where the infrastructure permits, where there is a local resource network, and dental educators with distance learning expertise. Dr. Paul Becker requested linking Odessa’s Institute of Stomatology and the ICD in terms of distance learning and Udente. Today, clear knowledge and insight into the educational set-up is vital (e.g., student number and training level) for tailoring our aid to suit their needs. Other suggested projects include the established link between Italy and Ethiopia with Professor Corrado Paganelli and Professor Peter Owen’s request for the ICD to act as an ambassador for improving standards within some of the African Dental Schools. Which project should the ICD support, what form should that support take and how can the ICD support the learning objectives vital to the success of Udente? All of these questions were asked. Professor Pat Reynolds at Kings College, London is developing a short support course entitled, ‘How Do You Do E-learning’ which could, with appropriate funding, be delivered to ICD Fellows, encouraging and enabling them to contribute to CE resources or other targeted topic areas, such as building the Udente library. Alternative learning methods are achievable by sending learning objects via CD-ROMs, as was done in Nepal. Although appreciated, this is a costly process with a limited number of benefactors. This highlights the importance of accurately assessing educational requirements, possessing good local contacts and having correct infrastructure in order to ensure that aid is utilized in the best manner. The process should be audited to assess the education and practical impact and the costs analysed, so that strategic decisions can be made. Nevertheless, this learning curve will lead to further investigation that may elucidate more ways of using this material. Professor W. Van Palenstein Helderman agreed to act as an advisor to the ICD on humanitarian projects. It may be possible, indeed necessary, for the ICD to join forces with dental non-governmental organizations (NGOs), such as Dentaid. The real need is for programs that are primarily preventative and, if treatment-based, should comprise basics, such as dealing with major oral disease or extractions, if unavoidable and if restorative should be limited to modern minimalist intervention, as published by the World Health organizations (WHO) basic oral care package. Enthusiasm for humanitarian project involvement should be applauded but ‘volunteer tourism’ does not necessarily serve a needy population more than temporarily. In terms of the wider umbrella of humanitarian aid, these projects must be simple, sustainable, cost effective, and population-based with defined objectives and a local dependable project co-ordinator. The FLAG Committee has some big decisions to make and will ultimately need the help and resources of every ICD Fellow.